L.A. rapper Cozz is a natural Thanksgiving host–a warm presence and an experienced foodie. Inviting some of his favorite people for an afternoon of great food and better conversation, Cozz hosts his first Friendsgiving in a charming new YouTube mini-doc. Hosted in conjunction with BET, the two-part series finds the Dreamville rapper kicking back with some of his best friends in showbiz, including singer Eric Bellinger, rappers Kap G and G. Perico, multimedia mogul Karen Civil, and others, as they enjoy their meal, have various holiday-themed discussions, and pay tribute to the late Mac Miller. Among the revelations: G. Perico was a big fan of A Nightmare Before Christmas as a kid, Karen Civil has a crush on Charlie Hunnam from Sons of Anarchy, and Cozz can’t hide his affection for Mariah Carey’s famous Christmas song. The second part of the video ends with an intimate interview between Karen and Cozz. The heartwarming video series allows fans to glimpse the heretofore-unseen domestic side of some of their favorite artists, and is essential viewing for your post-Turkey Day blues. Friendsgiving allowed Cozz to take a break from the “Win Or Lose” Tour, headlined by Dom Kennedy.As the primary support on the tour, Cozz played 15 shows on the East Coast and in the Midwest before heading west in Mid-November. After taking a short Thanksgiving break, the tour makes its way up and down the west coast until finishing in San Diego on December 7th. Buy tickets for the “Win Or Lose Tour” here. 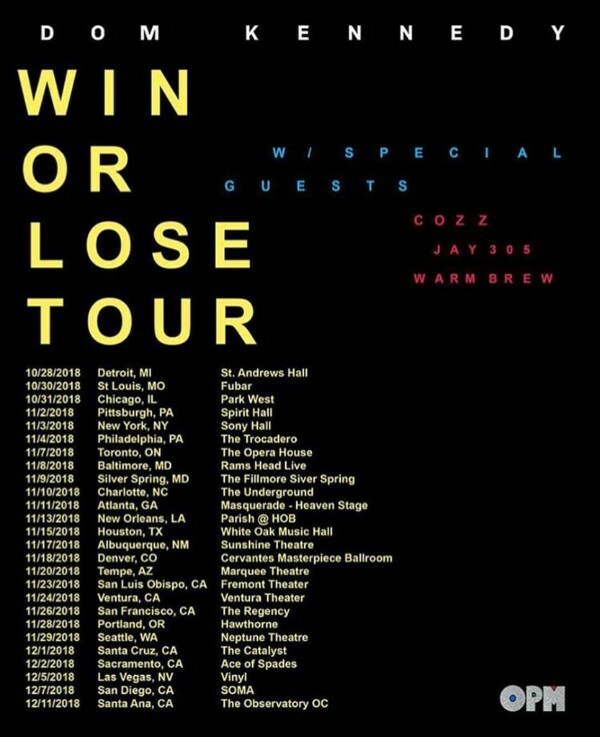 The prominent spot on the “Win Or Lose Tour,” which also features support from Jay 305 and Warm Brew, closes out an eventful 2018 for Cozz, who released Effected (Dreamville/Interscope Records),which features A-list collaborations with Kendrick Lamar, J. Cole, and Curren$y, in February, and headlined “The Effected Tour” in the Spring. A favorite artist of Issa Rae’s, Cozz earned a shout-out in the first season of Insecure.